NOTE: Values with a backslash (\) symbol in the Filter Names may be either returned without this symbol or not included in result set at all, so we recommend that you avoid using the backslash (\) symbol. Most of the data displayed on the Tableau Views can be filtered by different criteria. You can choose to include all measurements or exclude information that is currently irrelevant for you. Once filters are added to a Metric / Report or External Report for the first time, they are going to be automatically added to all new respective elements with the same Data Source / Worksheet. 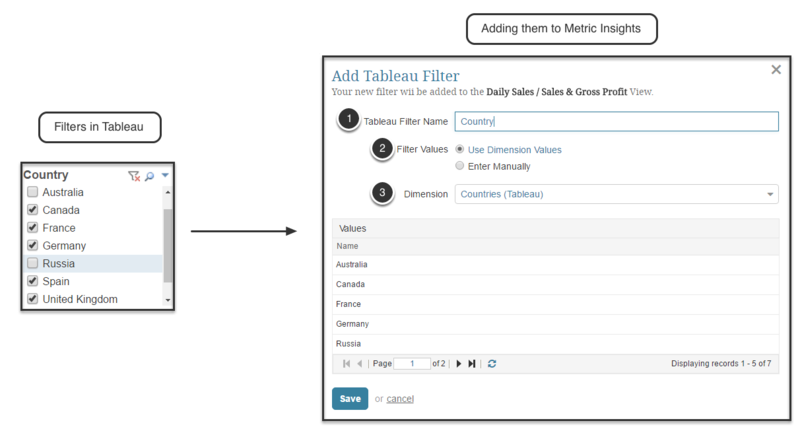 External Filters are tied to Tableau Worksheet, not Metric Insights' elements. This allows Filters to be reused for multiple elements (there is no need to create new Filters every time an element is created in Metric Insights). When setting up data collection for a Metric fetched from Tableau, after you define the respective Workbook and Worksheet that should serve as a Data Source at the Metric Editor > Data tab, you may pre-filter information that is going to be fetched. To do that, click [+ Tableau Filter]. Next, you can choose whether you are going to define filters manually or via Dimension Values. NOTE: Examples given below are taken from the Tableau View showed at the top of the page. Click [+ Add Value] and in the opened pop-up manually type in the name of the filter, for example, "Accessory". Save your entry. All the added values should appear in the Values list. If you have already used Tableau filters to create Dimensions in Metric Insights, you can quickly choose which Dimension Values you want to use for pre-filtering. Dimension: select a corresponding Dimension from the drop-down list and all its Dimension Values are going to be loaded to the Values list automatically.